The company had a mixed fourth quarter. CVS Health (CVS - Get Report) shares were falling Thursday despite the company beating the analyst consensus estimate on fourth-quarter earnings. However, CVS missed on revenue. CVS shares fell 1.1% to $76 The retail pharmacy and pharmacy benefit manager's adjusted earnings per share were $1.71 compared to the consensus of $1.68. The company reported revenue of $45.97 billion, below Street estimates of $46.50 billion. 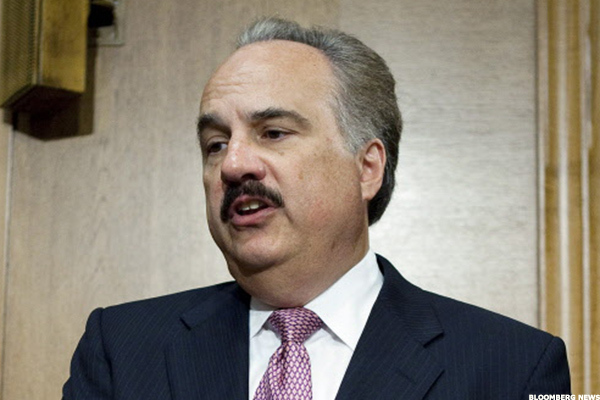 CVS CEO Larry Merlo addressed several investor concerns having to do with U.S. politics during the company's conference call. He first discussed the company's position on a potential repeal and replace of the Affordable Care Act. "We believe it's important to provide affordable coverage for all Americans which both Democrats and Republicans have acknowledged," Merlo said during the call. "However, at this point it is extremely difficult for us to comment on the possible scenarios that may play out in the coming months." Additionally, CVS confirmed its previously provided 2017 adjusted earnings per share guidance of $5.77-5.93 for 2017 compared to the consensus of $5.86. Free cash flow guidance of between $6 billion and $6.4 billion was also confirmed. Analysts were particularly interested in revenue from CVS' pharmacy services unit. The unit saw profits hit $31.26 billion during the fourth quarter, an 18% increase quarter over quarter. "The adjusted EPS beat was a highlight, and we view operational trends within each segment in-line or modestly better than CVS guided to previously," Mizuho analyst Ann Hynes wrote in a note. Hynes has a buy rating and a $90 price target on the stock. He added that CVS is prepared to pivot based on how the Trump administration and Congress eventually decide to repeal and replace the Affordable Care Act. Pharmacy benefit managers, including CVS' Caremark, could lose money as a result of ACA repeal. They could also be under pressure if President Trump extends his Twitter attacks not only at drug companies but other players in the health care space for rising medication and device costs. CVS executives addressed the role of pharmacy benefit managers in drug price setting, claiming they keep prices low. "We are the solution and not the problem," Merlo said. Drug companies have argued that PBMs and insurance companies bolster the prices of pharmaceuticals, rather than keeping them low for patients. Merlo used Mylan's (MYL - Get Report) EpiPen, which became a flashpoint for high drug prices last year, as an example. CVS announced previously that it would offer an EpiPen competitor, Impax' (IPXL generic version of Adrenaclick, for $110 in cash at all locations. He said this was thanks to the "urgent need" for a cheaper epinephrine autoinjector. "Increasing competition within therapeutic drug classes is a way to reduce drug costs," Merlo said during the call. "We are using our capabilities and scale to do just that." He added that the company could attempt to do something similar with other drugs. Merlo also discussed potential changes to the tax rate. Merlo said CVS pays the highest effective tax rate, which is around 39%. "Details around tax reform certainly will matter," Merlo noted. "A fairer tax code that includes a meaningful reduction, would allow CVS to do more."